The story of Salix is from its very beginning, a story of work in the face of hardship. In 1804, Captains Lewis and Clark of the United States Army, while on their exploratory trip to the Pacific Coast passed up the Missouri River and blazed a historic pathway on the western border of Iowa. Hundreds of trappers and explorers were to follow – all trade was carried on with reference to the Missouri River, which was the only highway to the great northwest. Keelboats, bullboats and finally, steamboats furnished the only means of transportation besides the pack horse. It took the whole summer to pole, row and tow a keelboat from St. Louis, Missouri to Fort Pierre in the Dakota’s. It was exhausting work for a crew of 20 or more men. 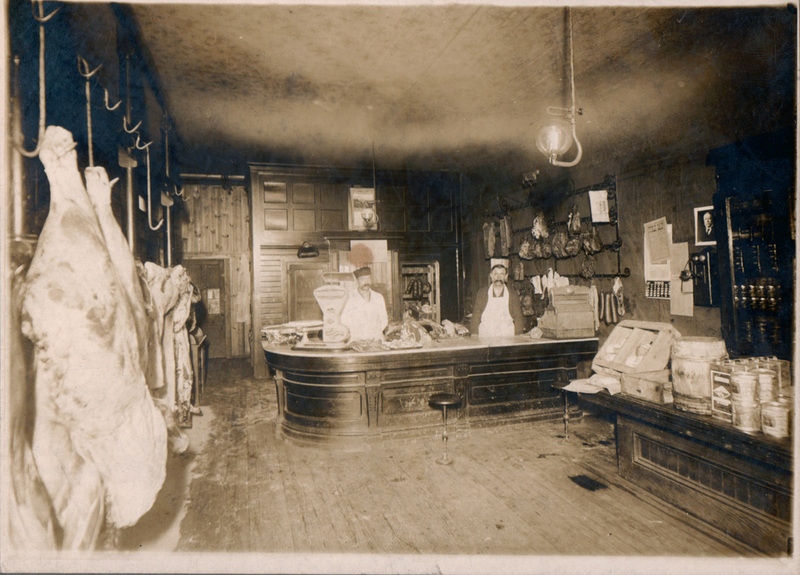 Supplies were carried up and furs were bought downstream by a mackinaw, a form of flatboat that could carry 15 ton and make 50 to 75 miles a day with the help of the current. Up to 1851, the western half of Iowa was on the map simply as unorganized Indian country - few settlers and no government. When the treaty with the Indians that ceded western Iowa and opened it for settlement had become known, it started a migration from the east. Since rivers served as the first inland arteries of trade and travel, the territory that was to be called Woodbury County had an important natural advantage but immigration slowed to a trickle during the Civil War in the early 60’s. The gigantic struggle between the north and south with its bloody harvest of death and desolation paralyzed for a time the great northwest. Previous to the coming of the settlers the country around Salix was but a vast expanse of virgin prairie. The wide stretch of country (called the bottom) between the Missouri River on the west and hills on the east was some 12 miles in width and covered with grass, and wild hay that grew to eight feet tall. The hills that rim the bottom land to our east are truly unique and a treasure to be protected. They were formed over 14,000 years ago by deposits of wind-blown silt. The Loess Hills, as they are called, run parallel to the Missouri River for 170 miles from north of Sioux City into the state of Missouri. This rare land form is found in only one other area of the world, mainland China. 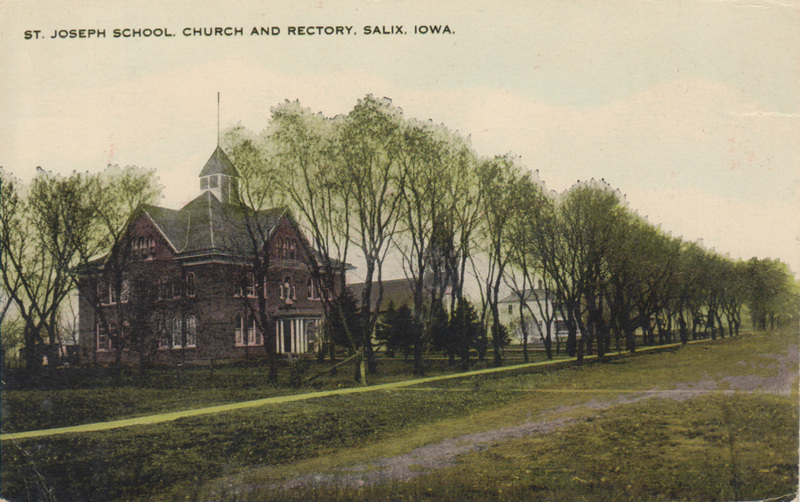 The building of the railroads had a wonderful effect on Woodbury County and the town of Salix. The Sioux City and Pacific Railroad Company built its line from Missouri Valley to Sioux City in the fall of 1867. Primitive Indian trails after a time developed into some semblance of permanent roads. The county of Woodbury, or Wahkaw, as it was first named was created by an act of the legislature in 1853. The division of the county into townships six miles square occurred between 1851 and 1853. The subdivision of the townships into sections was completed in 1855. Salix is located in Liberty Township and is bounded on the south by Lakeport and on the east by Grange and Sloan Townships. Settlers who had located here before these surveys had been made, were termed “squatters” and under the law had the first right to make homestead entry which until the spring of 1856 could only be done by traveling to the land office at Council Bluffs, Iowa, paying about $1.25 per acre and filing the necessary papers. 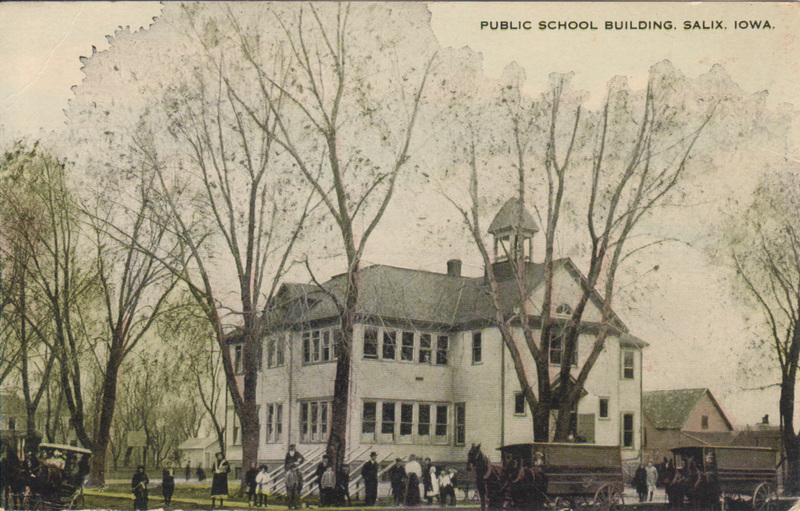 Later, the land office was moved to Sioux City. The earlier settlers were more or less transient types and land speculators. In 1860, a new breed of settler arrived. Log houses and sod shanties began to dot the landscape – very few had the means to purchase lumber to build a home. Slowly things began to improve, even with the constant threat from prairie fire and grasshopper invasions. Probably the first among the French Canadians to arrive in Salix were the LaCroix’s in 1868. The following year, the Lamoureux’s and the Hubert’s. The Choquette family in the early 70’s, and the Huot family in 1890. 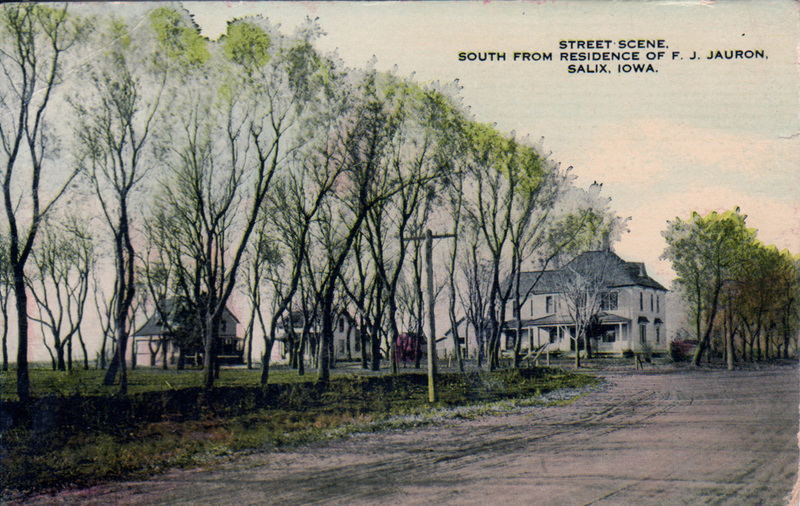 The Small’s and the Harrington’s came as railroad builders and settled on farms around Salix. The arrival of John Nairn from Minnesota in 1869 and the start of his saw mill in Lakeport Township about four miles southwest of Salix was a great boon to the economy of the area. Not only as a source of employment but it gave residents the lumber to build houses to live in instead of log houses and sod shanties. The saw mill was located in the midst of a forest containing thousands of acres of cottonwood and elm trees of monstrous size. Besides furnishing lumber and building materials, Nairn’s Mill also furnished many hundreds of cords of wood for fuel each year. Much of this wood was sold to the Sioux City and Pacific Railroad Company for their wood burning locomotives and in heating of the depots and railroad coaches. The wood was delivered in Salix or Sloan during the winter months. Five thousand or more cords of four-foot wood were piled in ricks - 8 feet high and 200 or 300 feet long. In the spring this wood was cut with a power saw and hauled to different places. 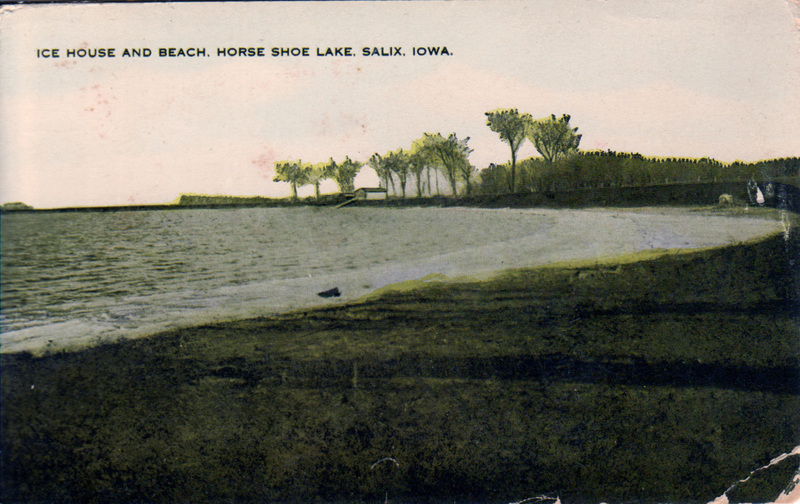 The town of Salix like some of its neighboring towns had its inception with the coming of the railroad. It is believed that the town was platted around 1868 by John L. Blair, the man who financed the building of the railroad. The railroad company had built a section house about two miles north of the present town site in what was known as Round Grove and it was probably the intention to locate the town at that place but it was later moved to its present site. The story goes that Mr. Joseph Small was one of the contractors in charge of building the railroad. While here, he purchased a farm west of town and stayed in the area. During an illness he was visited by a prominent official of the railroad and at some stage in the conversation, Mr. Small was asked if there was a favor that the Company could grant that would add to his comfort. 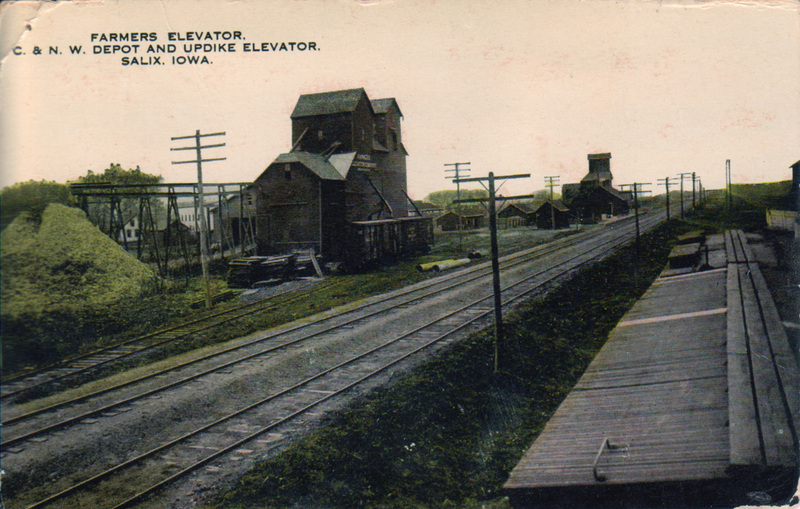 Mr. Small asked that he be given permission to stop the train when it was necessary for him to travel to Sioux City. From this beginning, that stopping place became known as the station and the railroad company gradually accepted this and as a result the town was located at its present site instead of at Round Grove. Round Grove, as I just mentioned originally, consisted of a track of about 100 acres of land covered with large cottonwood trees and entirely removed from any other wooded section. It was a beautiful area and was greatly admired by travelers who passed, both by rail and road. You can still see some remnants of that grove of cottonwoods today near the intersection of Highway 75 and the Luton Highway. The town of Salix originally called New Buffalo, received its name from the fact that the township was covered by the common willow tree. The City promoters did not want to call their village, Willow, so they took the botanical name for willow, which is Salix Longfolia, hence the name Salix. The town enjoyed substantial growth in the early 1880’s. 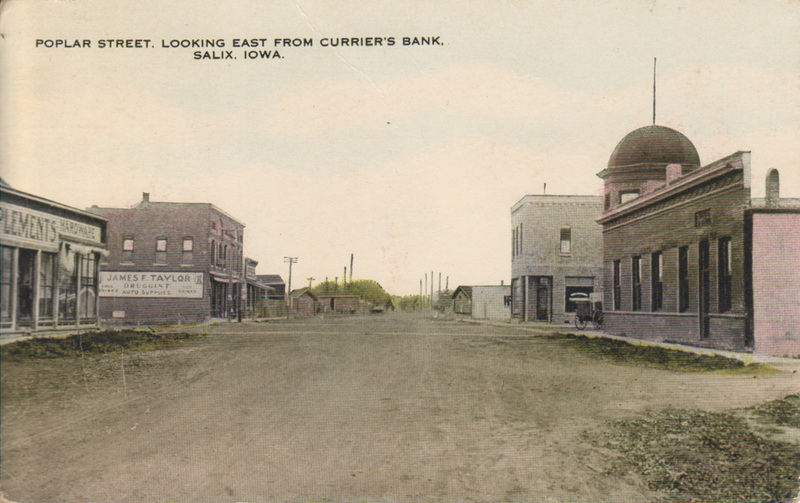 Many businesses were established and homes were built and even sidewalks were put down. 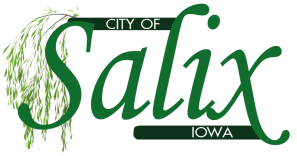 Salix became one of the most thriving trading centers between Missouri Valley and Sioux City. Then tragedy struck in October 1892, when a fire broke out in the business district and totally destroyed over fifty businesses and homes in a four block area. The fire started around seven in the evening and by midnight all that was left of Salix was two grain elevators, the vinegar factory, less than a dozen homes and a couple of corn cribs. Some businesses rebuilt, but Salix was never the same. My story is about the beginnings of our town. What makes the story never end is the people. Their names were here in the beginning and after 140 years, the same names are still here. The wheel of memories will roll on forever.